“Students at BASIS Independent McLean look out for others inside and outside of their community. They have self-initiated many service drives. The administration always supports students when they want to do an event, but the students do the work!” says Communications Manager Mary Cunningham. The students at this campus have been involved in a number of initiatives, both local and far-reaching. 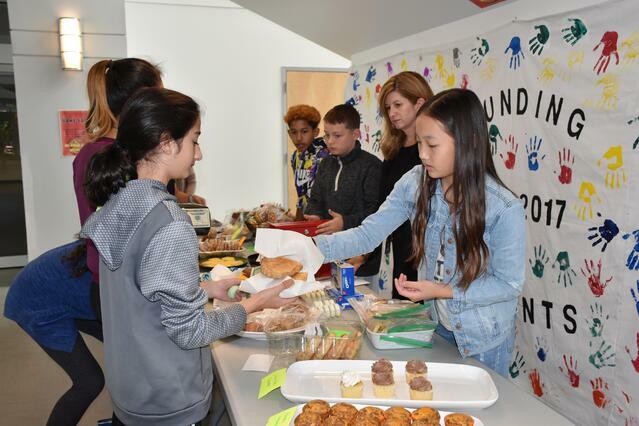 The entirely student-driven bake sale and art show off site that raised over $900 for Save the Children to benefit Hurricane Maria victims. Yearbook Club organized a twist on a Thanksgiving Food Drive where ultimately nine full boxes of dried and canned food were donated to SHARE of McLean, a local food pantry. The food drive, called “Cans for Candygrams” was designed by students to elicit not just a desire to give to those less fortunate, but create an opportunity to give thanks to their school community. Those who donated also write a note of thanks or gratitude to a peer or teacher. Students organized Candy for Troops to send something sweet to active duty military overseas through Operation Gratitude. There are many more opportunities for students to give back on the horizon. A new Service Learning Club formed out of student interest will provide students with opportunities to be involved in community service on and off campus, beginning upon return from the holiday break. The school was recently approved for a chapter of National Honor Society and National Junior Honor Society, which means these great displays of giving back will only continue to grow. Earlier this year, a group of entrepreneurial students across all grades spent their summer turning a used textbook resell campaign into a source of funds for school supplies for a few schools in the area. The initial idea was simple—Junior Dennis W. realized that students in schools recently in the press for financial issues at the district level might not experience the joy brought by the yearly assortment of fresh school supplies, or worse, may not have the learning materials needed in the classroom. Leveraging additional resources such as neighborhood blogs and a successful GoFundMe campaign, the work of 20 students resulted in a ton (literally) of school supplies for two schools. Check out the school’s blog post on the project and the San Jose Mercury News’ coverage of the efforts. Earlier this year when the North Bay fires were blazing, their community filled over four bins of donations to victims of the devastating fires. More recently, the school surpassed their Giving Tree drive, with 223 gifts donated this year to children in need versus 172 last year. Students in our TK–6 program in Fremont are young to be leading student service projects of their own, but that doesn’t stop them from contributing to the betterment of their school and local community. At the beginning of the holiday season, the school hosted a food drive to benefit the Tri-City Volunteers food bank. Check out the Tri-City Voice Article about the students’ efforts. The school also has a monthly S.T.I.N.G.E.R. award to encourage service and exemplary citizenship within their school community. This award is a huge point of excitement for BASIS Independent Fremont Bumblebees! This award is based on the following values: Safe, Trustworthy, Industrious, Noble, Gritty, Empathetic, Respectful (students are nominated by teachers if they fall into positive traits we strive to reinforce). 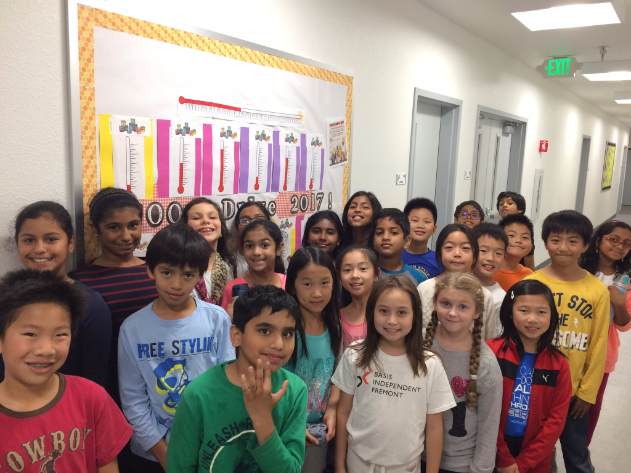 Each month at BASIS Independent Manhattan, a new campus as of fall 2017, the students are learning about one of the 5C’s (Citizenship, Courage, Compassion, Creativity, and Confidence), which are the pillars of their school community. 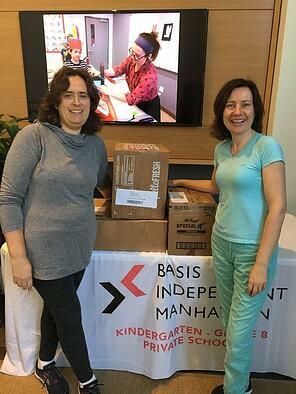 Communications Manager Christine Klayman shared, “They immediately embraced Citizenship and Compassion, especially within BASIS Independent Manhattan and among their classmates. One particularly thoughtful student in grade 6 organized a group of kids who help the custodial staff clean up the cafeteria every day after their lunch period to prepare it for the next grade level. They know it isn’t their job, but they just want to lend a helping hand.” To this day, the group has grown in number and continues to make a very clear and direct positive impact on our physical space as well as in student and staff relations. The school is well on its way to finding its footing in the student service arena. 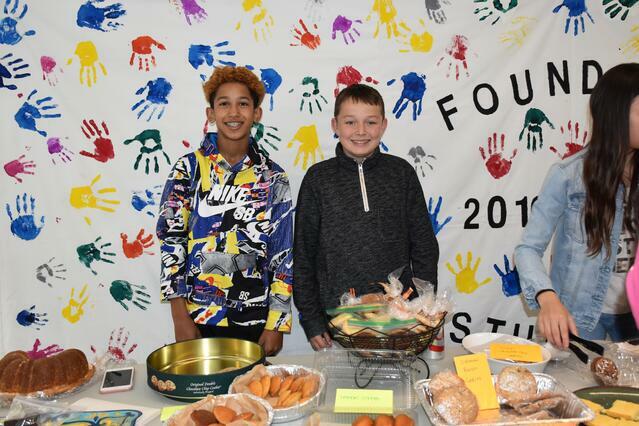 While they don’t have any established service traditions or clubs just yet, students, families, and staff have self-organized to support those in need. 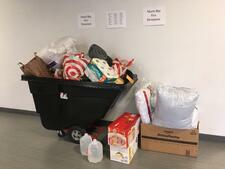 After Hurricane Maria, community members quickly jumped into action and started a relief drive—many at the campus have family and friends who were directly affected. Students participated in a Halloween Candy GIVE-back Collection to benefit Operation Gratitude. This was especially poignant following the terror attack in lower Manhattan on Halloween and this charity not only supports troops, veterans, and wounded heroes, but also first responders. Their community donated 55 pounds of candy, toothbrushes, and toothpaste along with handwritten notes thanking our servicemen and women for their work. High school students developed and ran an entirely student-led food drive, asking for canned and boxed food for a local shelter, CHiPS (Christian Help in Park Slope). 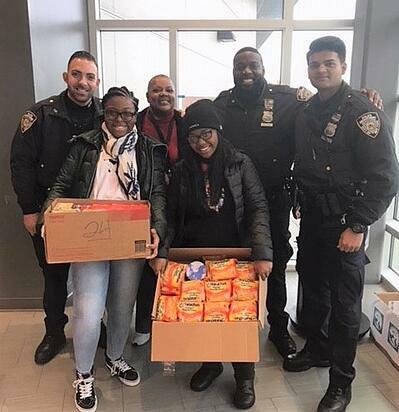 Student Kayla F. used her contacts within the Red Hook Justice Center to request officers to help transport the boxes of items they raised. On the opposite age spectrum, The Early Learning Program ran a drive for the Animal Care Center (ACC) to keep bellies full and tails warm in the cold New York City winter months. After the devastating natural disaster, families across all student grade levels rallied to support Hurricane Maria relief with a goods drive. 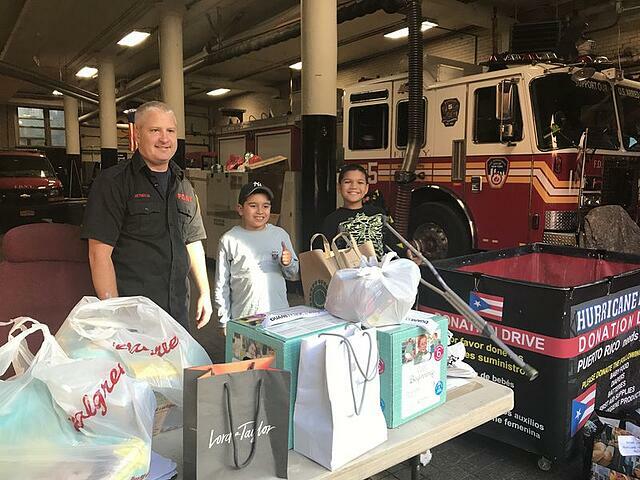 Students, staff, and families connected with local Brooklyn officials working to provide emergency items needed in Puerto Rico in the wake of Hurricane Maria. It isn’t just our students who are involved in local community initiatives. 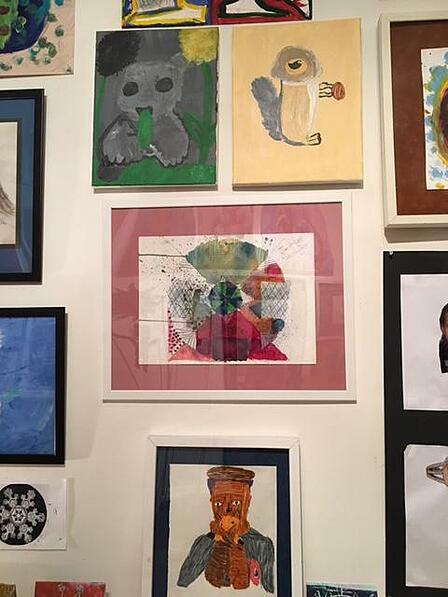 Just down the street from the campus is the Red Hook Art Project where parents volunteer to help with their “Homework Help” program as well as share artistic skills in the arts-based organization. 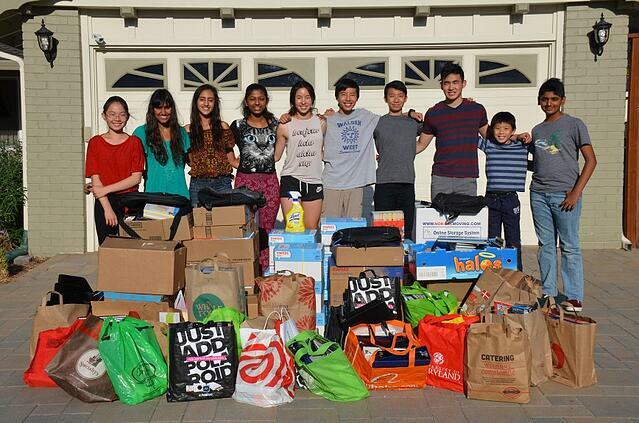 Just recently, families raised funds and donated items to the family Thanksgiving at the RHAP for their 35 families. Read more about the program in this blog piece. With each passing year we grow more and more proud of the students in our program. Their accomplishments extend so far beyond the classroom. Not only does their service to local organizations, schools, and individuals grow their perspective and understanding of others, they also develop skills in leadership, communication, collaboration, and problem-solving. As we fast kick off the new year, we can’t wait to see what amazing work will come from our communities next.